1. 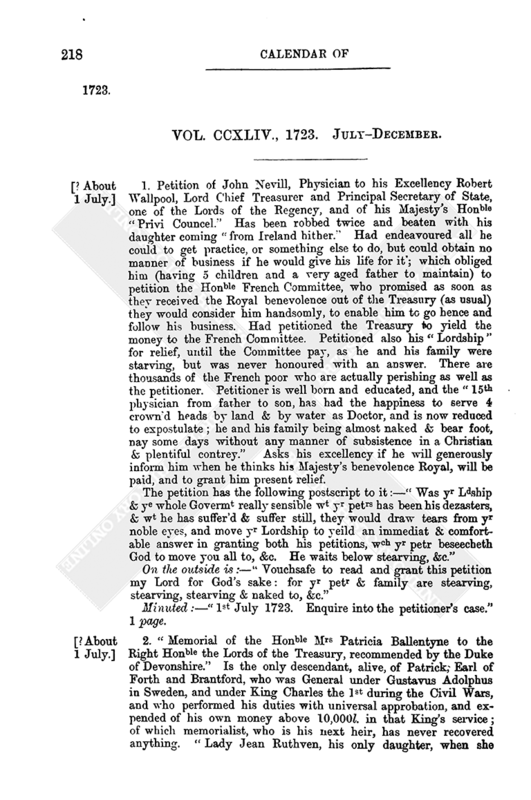 Petition of John Nevill, Physician to his Excellency Robert Wallpool, Lord Chief Treasurer and Principal Secretary of State, one of the Lords of the Regency, and of his Majesty's Honble “Privi Councel.” Has been robbed twice and beaten with his daughter coming “from Ireland hither.” Had endeavoured all he could to get practice, or something else to do, but could obtain no manner of business if he would give his life for it; which obliged him (having 5 children and a very aged father to maintain) to petition the Honble French Committee, who promised as soon as they received the Royal benevolence out of the Treasury (as usual) they would consider him handsomly, to enable him to go hence and follow his business. Had petitioned the Treasury to yield the money to the French Committee. Petitioned also his “Lordship” for relief, until the Committee pay, as he and his family were starving, but was never honoured with an answer. There are thousands of the French poor who are actually perishing as well as the petitioner. Petitioner is well born and educated, and the “15th physician from father to son, has had the happiness to serve 4 crown'd heads by land & by water as Doctor, and is now reduced to expostulate; he and his family being almost naked & bear foot, nay some days without any manner of subsistence in a Christian & plentiful contrey.” Asks his excellency if he will generously inform him when he thinks his Majesty's benevolence Royal, will be paid, and to grant him present relief. Minuted:—“1st July 1723. Enquire into the petitioner's case.” 1 page. 2. “Memorial of the Honble Mrs Patricia Ballentyne to the Right Honble the Lords of the Treasury, recommended by the Duke of Devonshire.” Is the only descendant, alive, of Patrick, Earl of Forth and Brantford, who was General under Gustavus Adolphus in Sweden, and under King Charles the 1st during the Civil Wars, and who performed his duties with universal approbation, and expended of his own money above 10,000l. in that King's service; of which memorialist, who is his next heir, has never recovered anything. “Lady Jean Ruthven, his only daughter, when she belonged to the late Princess Sophia, the King's Royal mother was married in Germany to James, Lord Forrester,” memorialist's father, whose estate and honour descended to a collateral branch, being unfortunately murdered, left her very poorly provided. Has avoided as much as possible to beseech relief until now, in her great age, when she is reduced very unwillingly to claim some benefit of the merit of her grandfather, who never was a charge to the crown; prays to be provided for on the civil list. Minuted:—“1st July 1723. My Lords cannot advise at this time any new pencon, the King being abroad.” 1 page. 3. Lord Carlisle to “My Lords.” His Majesty having appointed an allowance of 40l. to be issued out of the Treasury for the Swainmote Courts of Windsor Forest, and the time for holding the courts drawing near, desires an order for the payment of the 40l. for this year. Minuted:—“40li for holding the Swainmote Court. 24th July 1723. Prepare a warrt.” 1 page. 4. 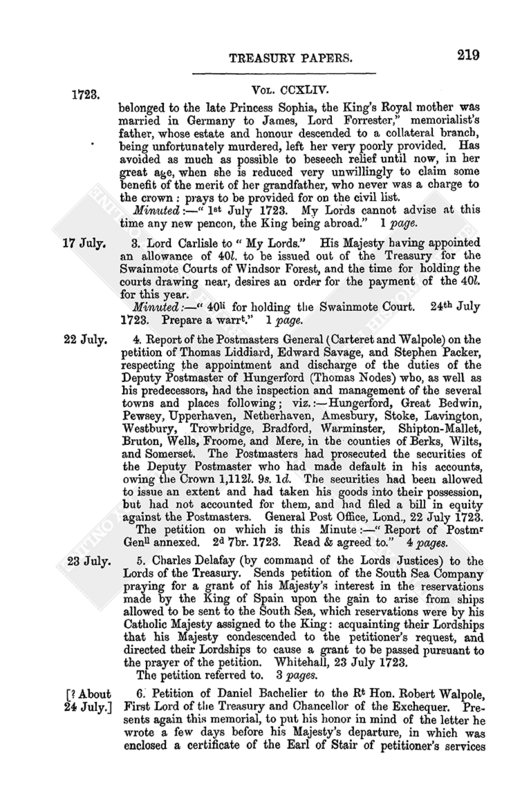 Report of the Postmasters General (Carteret and Walpole) on the petition of Thomas Liddiard, Edward Savage, and Stephen Packer, respecting the appointment and discharge of the duties of the Deputy Postmaster of Hungerford (Thomas Nodes) who, as well as his predecessors, had the inspection and management of the several towns and places following; viz. :—Hungerford, Great Bedwin, Pewsey, Upperhaven, Netherhaven, Amesbury, Stoke, Lavington, Westbury, Trowbridge, Bradford, Warminster, Shipton-Mallet, Bruton, Wells, Froome, and Mere, in the counties of Berks, Wilts, and Somerset. The Postmasters had prosecuted the securities of the Deputy Postmaster who had made default in his accounts, owing the Crown 1,112l. 9s. 1d. The securities had been allowed to issue an extent and had taken his goods into their possession, but had not accounted for them, and had filed a bill in equity against the Postmasters. General Post Office, Lond., 22 July 1723. The petition on which is this Minute:—“Report of Postmr Genll annexed. 2d 7br. 1723. Read & agreed to.” 4 pages. 5. Charles Delafay (by command of the Lords Justices) to the Lords of the Treasury. Sends petition of the South Sea Company praying for a grant of his Majesty's interest in the reservations made by the King of Spain upon the gain to arise from ships allowed to be sent to the South Sea, which reservations were by his Catholic Majesty assigned to the King: acquainting their Lordships that his Majesty condescended to the petitioner's request, and directed their Lordships to cause a grant to be passed pursuant to the prayer of the petition. Whitehall, 23 July 1723. The petition referred to. 3 pages. 6. Petition of Daniel Bachelier to the Rt Hon. Robert Walpole, First Lord of the Treasury and Chancellor of the Exchequer. Presents again this memorial, to put his honor in mind of the letter he wrote a few days before his Majesty's departure, in which was enclosed a certificate of the Earl of Stair of petitioner's services “done in France to his Majesty during the ambassy of that Lord to the French Court,” and these were of such a nature that they drew upon him the resentment of the French King, by whose order the estate of the petitioner, exceeding much the pension of 300l. given him here, was confiscated. His Honor had told petitioner the next day at Court that he would not forget him (the petitioner), which encouraged him to present a letter last week to ask that the arrears of his pension might be forthwith paid, because he and his numerous family were reduced to great extremities. Minuted:—“24 July 1723. Wt is his pencõn & wt due thereupon. 300li p[er] ann. payable by Mr Chetwynd, one year due at Midsmr 1723. 25 July 1723. He is paid as far as the rest.” 1 page. 7. Memorial of William Wood, Esq., to the Lords of the Treasury, in relation to the securities he has to give in accordance with the indentures between his Majesty and memorialist for coining copper money for Ireland and mixed metal for all his Majesty's dominions in America. On the next page are proceedings thereon. With this memorial is a petition of the Provost and the rest of the Company of moneyers of H.M. Mint, in which they state that they have been a Corporation for 400 years, and that they understand Mr Wood has obtained the above grant with liberty to set up a mint at Bristol. Think it their duty to represent that in the reign of the late King James a grant was obtained for coining tin halfpence and farthings, out of the Mint, which gave many evil-disposed persons an insight into the art and mystery of coining, which occasioned the speedy adulteration of the silver coin, and in a few years vast quantities of counterfeit money appeared, to the great prejudice of trade and loss to the nation. Are now willing to contract with the memorialist on the same terms as they did with Sir Jos Herne and others for coining copper in the reign of King William and Queen Mary: ask for consideration. Undated. 2 pages. 8. Barons of the Exchequer of Scotland to the Lords of the Treasury. Transmit draft of signature for granting to Arthur Balfour and his five brothers and sisters, children of John Balfour, late of Fairney, 500l. each, out of the surplus of the estate of Burleigh, forfeited by the attainder of John Balfour. Edinbr, Excheq. Chambr, 31 July. Minuted:—“2 7ber 1723. Agreed.” 4 pages. 9. Report of the same Barons on the petition of Alexander Murray, of Stanhope, Esq. Are of opinion that by virtue of an Act of Parliament made in Scotland in 1592 “a right is communicated to the subjects” here, to obtain from his Majesty such grant as is asked for by petitioner, for working and carrying on mines in his own lands; and that the “signature” transmitted is valid and effectual, though there is no concurrence of a master of metals, as required by the Act, that office having been long disused. The duty reserved to his Majesty must be collected by such officer as his Majesty shall see fit to appoint, it being impracticable to carry on the course of refining the ore in the manner as by the Act is directed. Same date. The mine was in Argyleshire. Minuted:—“6 Feb. 1723–4. To be transcribed for his Mats signature.” 5 pages. 10. Report of the same on the petition of Alexander Brodie, of Brodie, Esq. 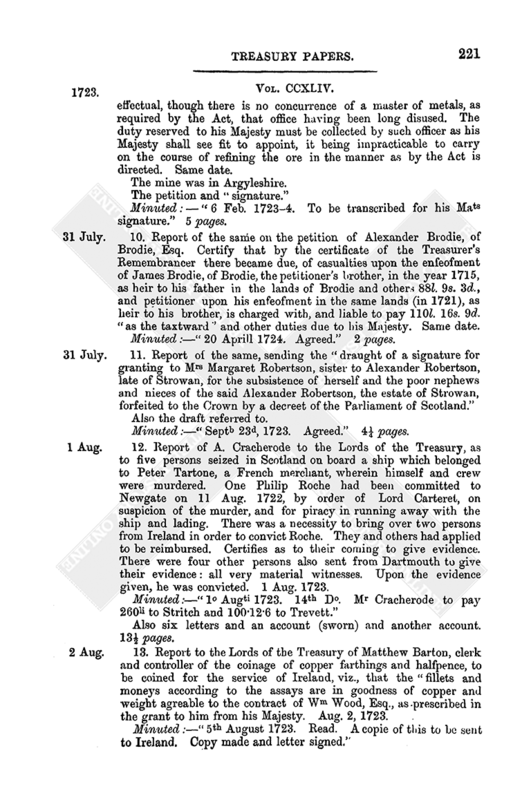 Certify that by the certificate of the Treasurer's Remembrancer there became due, of casualties upon the enfeofment of James Brodie, of Brodie, the petitioner's brother, in the year 1715, as heir to his father in the lands of Brodie and others 88l. 9s. 3d., and petitioner upon his enfeofment in the same lands (in 1721), as heir to his brother, is charged with, and liable to pay 110l. 16s. 9d. “as the taxtward” and other duties due to his Majesty. Same date. Minuted:—“20 Aprill 1724. Agreed.” 2 pages. Also the draft referred to. Minuted:—“Septb 23d, 1723. Agreed.” 4¼ pages. 12. Report of A. Cracherode to the Lords of the Treasury, as to five persons seized in Scotland on board a ship which belonged to Peter Tartone, a French merchant, wherein himself and crew were murdered. One Philip Roche had been committed to Newgate on 11 Aug. 1722, by order of Lord Carteret, on suspicion of the murder, and for piracy in running away with the ship and lading. There was a necessity to bring over two persons from Ireland in order to convict Roche. They and others had applied to be reimbursed. Certifies as to their coming to give evidence. There were four other persons also sent from Dartmouth to give their evidence: all very material witnesses. Upon the evidence given, he was convicted. 1 Aug. 1723. Also six letters and an account (sworn) and another account. 13½ pages. 13. Report to the Lords of the Treasury of Matthew Barton, clerk and controller of the coinage of copper farthings and halfpence, to be coined for the service of Ireland, viz., that the “fillets and moneys according to the assays are in goodness of copper and weight agreable to the contract of Wm Wood, Esq., as prescribed in the grant to him from his Majesty. Aug. 2, 1723. W. Wood's petition, in which he asks that the report should be made. 2 pages. Minuted:—“7th August 1723. The Commrs Navy to certifie if it appears that these sums for short allowance have been paid by ye agent victualler at Portsmo; and likewise by ye Treasurer of the Navy upon ye ship's books, whereby it may appear that double paymt has been made to ye same persons for the same service.” 7 pages. 15. The Secretary to the South Sea Company (D. Wescomb) to H. Kelsall, Esq. In answer to a letter requiring more exact information, as to four articles in the South Sea Company's memorial, for allowing extraordinary charges arising by the late subscriptions. Acquaints him, for the information of the Lords of the Treasury, (1) as to the 500l. for house rent, the thing required so much haste and expedition that the company was forced to buy the houses wherein the subscriptions were taken, at a cost of 10,600l., besides 2,000l. more to make them fit. The houses are so old that they must be rebuilt or be unfit for service. Minuted:—“Agree.” (2) As to the payment of 500l. to the Clerks at the Bank; it was bonâ fide paid. Minuted:—“Agree.” (3) As to 500l. for contingent charges, called Mr Safford's disbursements, they consist of sundry disbursements charged in his book for subscriptions. Minuted:—“Disallowed.” (4) As to the solicitor's disbursements, 300l. was paid him for advising with counsel, drawing cases relating to subscriptions, &c. Minuted:—“Allowed.” South Sea House, 8th August 1723. Report on the same subject. Signed, H. Kelsall. Minuted:—“11th Augt 1723. Read. The minutes are set against the several articles. The report of the other articles is agreed to.” 3½ pages. 16. John Wentworth to “My Lords.” Sends copies of the Journal of the General Assembly of the Province of New Hampshire from 10 Dec. 1722 to 1 June 1723. The stores in H.M. Fort William and Mary, at New Castle, are very small and low. Hopes Governor Shute has made proper applications for some recruits, otherwise they will be in a very poor condition. Also sends Mr Collector Armstrong's accounts to the 25th of June 1723, from which time Butts Bacon, Esq, was admitted collector. There being no officer in this place appointed from home to take care of H.M. woods, &c., the writer will take all possible care to prevent spoil. Mr Armstrong, who had a deputation from Mr Burniston, the Surveyor General, has left with the writer his deputation and instructions. Suggests to their Lordships that the commanding officer of this Province, seeing every thing that passes, is likely to serve the King's interest more effectually in the preservation of his Majesty's woods than any Deputy or Sub-deputy Surveyor, and the people will stand in more fear of him. Has served as Lieut. Governor of H.M. Province of New Hampshire near six years, and has spent and still spends 300l. a year more than his income; and this he does cheerfully and willingly to support the honour of his Commission. The Governor in Chief residing in Boston, the whole charge lies on the Lieut. Governor, and the income does not amount to 200l. a year, when the Governor of Boston or any Chief Governor is in the country. Prays that his circumstances may be considered, and that he may have such an allowance as to enable him to do the duty of Surveyor of H.M. Woods, which is now more immediately under his care, and cannot be carried on without considerable charge. Resolves not to make a penny perquisite of the place, because he will not be under any obligation to the cutters of timber. It is his great misfortune that he is not known to their Lordships. Is known to Col. Shute, his Governor, and to Governor Phillips, of Nova Scotia, from whom their Lordships may have his character. Province of N. Hampshire, August the 20th, 1723. 17. Memorial of Anthony Cracherode to the Lords of the Treasury. The 3,150l. imprested to memorialist has been all expended, partly in discharge of their Lordships' warrants for considerable rewards to many persons, and partly in his Majesty's other affairs. Has been ordered to pay various further sums. Prays that their Lps would order him 1,680l. on account, and the further sum of 500l. to carry on H.M. affairs. 23 Aug. 1723. Minuted:—“23 Aug. 1723. My Lords have this day signd a warrt for 1,000li to be imprested to him, and order another warrt for 1,000li more to him.” 1½ pages. 18. Samuel Heckford to the Secretaries of the Lords of the Treasury. In the absence of Mr Jobber (who was brought over from Ireland to give evidence against Roch, executed for piracy) applies to have Mr Jobber's claim laid before their Lordships that Mr Cracherode may be ordered to reimburse him the sum of 86l. 16s. paid by him on this business. Norfolk Street, 26 Aug. 1723. Letter of Michael Stretch, enclosing copies of two letters from the Lords Justices of Ireland, also petition of Edward Trevett, of the Kingdom of Ireland, mariner, another witness in the same case praying for satisfaction. Minuted:—“28th Augt 1723. My Lords do not think fit to do any thing in this.” 4 pages and 2 halves. 19. 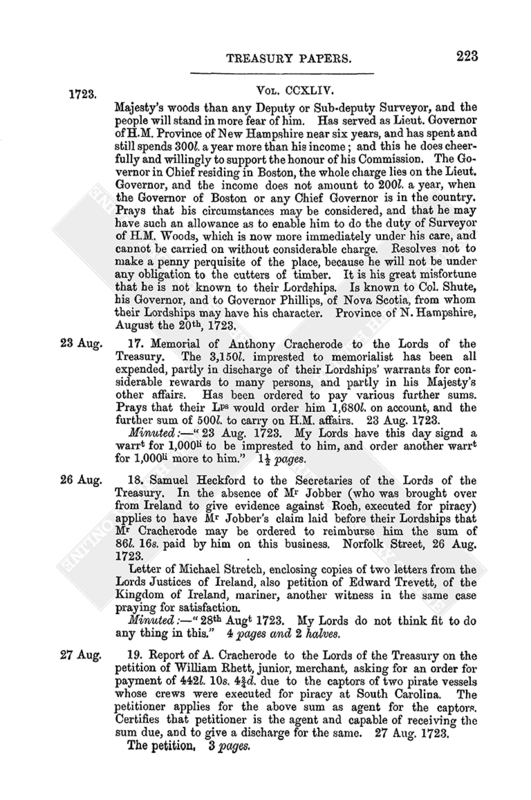 Report of A. Cracherode to the Lords of the Treasury on the petition of William Rhett, junior, merchant, asking for an order for payment of 442l. 10s. 4¾d. due to the captors of two pirate vessels whose crews were executed for piracy at South Carolina. The petitioner applies for the above sum as agent for the captors. Certifies that petitioner is the agent and capable of receiving the sum due, and to give a discharge for the same. 27 Aug. 1723. 20. “A state of the coal duty granted for building churches, &c.” 2 pages. On the back is a note from Mr Chr. Tilson to Mr Cracherode, and reply from the latter that the prosecution was not under his management and he knew nothing of it. 2 pages. 22. Ba: Adams to the Lords of the Treasury. Has been in London and other ports and finds there are tidesmen put on all “outerbounds” at a charge at least of 2 or 3,000l. per ann. and not 2d. advantage: for there is a very great Guinea and Virginia trade, and the Guinea man usually carries a hogshead or 2 of tobacco for the use of the negroes, and they stow it away for fear of the sailors; and neither sailor nor tidesmen ever sees it after stowing, till they come to Guinea, and a tidesman does as much good there as he would do “if a top on Bansted downe.” Likewise Virginia men perhaps take a box of pepper for their own use, which they cannot be without, no more than the Guinea men without tobacco, and these have two officers a piece, likewise at 6s per day charge for each ship; and ships bound to other parts take some trusses of tobacco. It cannot be imagined that merchants for trifles would run the risk of having their ships exchequered, and lose their voyages, besides other penalties. At the several ports of this kingdom there are seldom less than 30 “outerbounds,” if not 40, at 6s a day each; or at least 4s a day each ship. If their Lordships think this expense may be saved, it is all the satisfaction that is desired. September 7, 1723. Minuted:—“8 Septr 1723. Read & disapproved.” 1 page. 23. Report of the Postmasters General (Carteret and Walpole) to the Lords of the Treasury on the petition of William Trench, Esq. The petitioner has produced several certificates, some of them recommending him as deserving protection and encouragement in the maintenance of the Lighthouse at the Skerrets, and all of them alleging the continuance of the lighthouse to be very necessary and useful for such ships as pass these seas. The Irish packet boats have the benefit of the Skerrets' lights, in common with other ships which trade upon that coast; but the packet boats upon their several stations have hitherto in this respect been put upon the footing of the men-of-war and have ever been exempted from paying to any lights, or ony other duties whatsoever. If their Lordships think fit to order it otherwise, in this particular case, it may prove to be a precedent “that may very much prejudice the service which, in the nature of it, requires the utmost freedom from all such matters, which may occasion delay or interrupt the service upon any pretence whatsoever.” General Post Office, London, Sept. 11, 1723. 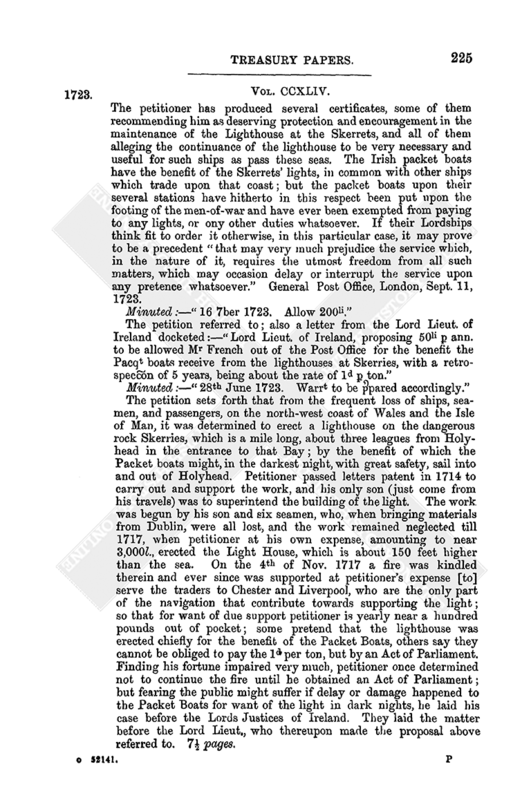 The petition sets forth that from the frequent loss of ships, seamen, and passengers, on the north-west coast of Wales and the Isle of Man, it was determined to erect a lighthouse on the dangerous rock Skerries, which is a mile long, about three leagues from Holyhead in the entrance to that Bay; by the benefit of which the Packet boats might, in the darkest night, with great safety, sail into and out of Holyhead. Petitioner passed letters patent in 1714 to carry out and support the work, and his only son (just come from his travels) was to superintend the building of the light. The work was begun by his son and six seamen, who, when bringing materials from Dublin, were all lost, and the work remained neglected till 1717, when petitioner at his own expense, amounting to near 3,000l., erected the Light House, which is about 150 feet higher than the sea. On the 4th of Nov. 1717 a fire was kindled therein and ever since was supported at petitioner's expense [to] serve the traders to Chester and Liverpool, who are the only part of the navigation that contribute towards supporting the light; so that for want of due support petitioner is yearly near a hundred pounds out of pocket; some pretend that the lighthouse was erected chiefly for the benefit of the Packet Boats, others say they cannot be obliged to pay the 1d per ton, but by an Act of Parliament. Finding his fortune impaired very much, petitioner once determined not to continue the fire until he obtained an Act of Parliament; but fearing the public might suffer if delay or damage happened to the Packet Boats for want of the light in dark nights, he laid his case before the Lords Justices of Ireland. They laid the matter before the Lord Lieut., who thereupon made the proposal above referred to. 7½ pages. 24. Petition of Sarah Stuckey, widow, to the Lords of the Treasury. Valentine Stuckey, father to petitioner's late husband, being linen draper to King Charles II., there was due to him 2,500l., and a further sum of 210l. 14s. 3d. for money lent. King James II. gave orders for the payment of the “2,000l.,” but before any advantage could be had thereby he departed this realm, so that the money remained unpaid. In consequence thereof petitioner's late husband had to sell a freehold estate of 400l. per ann., part of which was settled in jointure on petitioner, whose husband died, leaving nothing more than a small leasehold estate held from the crown. Petitioner had applied for a renewal of the lease, and now asks that the fine of 130l. set by the Surveyor should be remitted. Minuted:—“11th Septr 1723. Rejected.” 1 page. 25. 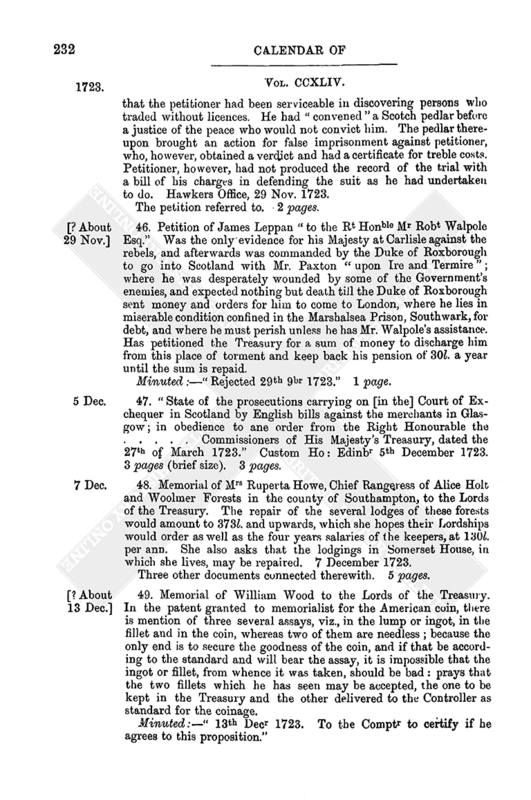 Report of Sir Isaac Newton to the Lords of the Treasury on the memorials of the “General” and Master of H.M. Mint at Edinburgh. Represents that by the Coinage Act of the last session, H.M. sign manual directed to the General (17 Nov. 1718) is become void, and a new one may be procured to the Master for putting in force the indenture between the late Queen Ann and the Master until a new indenture shall be made, and that 2,100l. [should] be imprested upon account to the Master for the service of that mint as desired. Mint Office, 13 Sept. 1723. The memorials and a copy of the sign manual referred to. 5½ pages. 26. Barbadoes. Henry Worsley to the Lords of the Treasury. Encloses (1) the reply of William Dalrymple, Esq., Receiver General of his Majesty's casual revenue, and of John Ashley, Deputy Auditor General, to the representation (formerly sent) of the Custom House officers touching the casual revenue; (2) the Custom House officers' rejoinder to the reply. This he left entirely to their Lordships, being a sort of party concerned in the quarrel, having ordered the Custom House officers to sell the seizures themselves, and not have them sold by the Provost-Marshal, which is not only more expensive, but, as he is informed, was never the practice before; and (3) an account of the fines and forfeitures at the last court of Grand Sessions. Barbadoes, 24 Sept. 1723. Accompanied by the enclosures referred to. Besides which with (No. 1) there is another paper containing copies of various documents on the same subject, and with No. 3 is a letter of an earlier date as to proposals for dividing and selling certain brandies. 32 pages. 27. 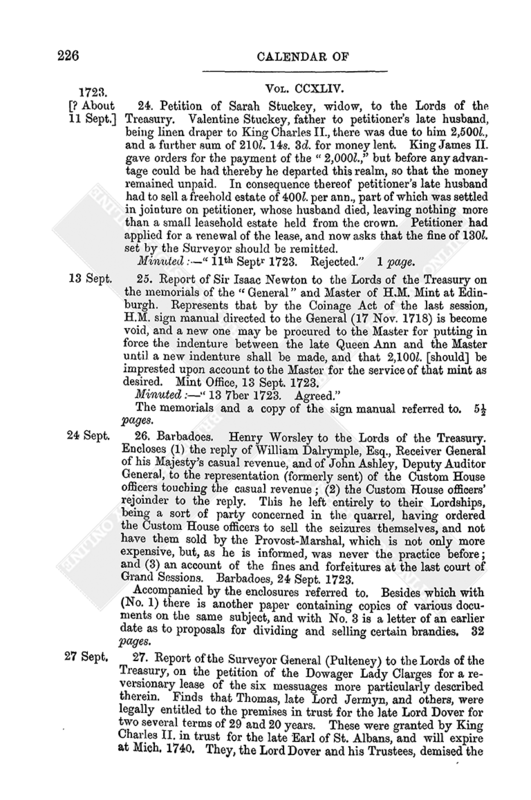 Report of the Surveyor General (Pulteney) to the Lords of the Treasury, on the petition of the Dowager Lady Clarges for a reversionary lease of the six messuages more particularly described therein. Finds that Thomas, late Lord Jermyn, and others, were legally entitled to the premises in trust for the late Lord Dover for two several terms of 29 and 20 years. These were granted by King Charles II. in trust for the late Earl of St. Albans, and will expire at Mich. 1740. They, the Lord Dover and his Trustees, demised the tenements to Sir William Clarges, Bart., late husband to petitioner, his executors, &c. for 28¼ years, from 25 June 1711, which will expire at Mich. 1739. Sir Walter Clarges devised the same messuages, which are situated together on the south side of Piccadilly, to petitioner (being part of the Bailiwick of St James's). Four of the six messuages have a frontage of 72 feet to Piccadilly and in depth 77 feet. They are worth at a rack rent 115l. per. ann. Two others have 32 feet frontage on Piccadilly, and are 77 feet in depth, and are worth 100l. per ann. Has made a report on the petition of Thomas Lobb, Esq., for a reversionary lease of the two last messuages. It appears that the tenant right of these two is in the Lord Dover's trustees, &c. Petitioner is the next and immediate crown tenant, and a lease may be granted to her for 33 years from Mich. 1740, for a fine of 282l. 8s. 7d., reserving a rent of 2s. 6d. in the pound amounting to 26l. 17s. 6d. per ann. But if a lease be granted of the four first only, then a fine of 130l. will be a valuable consideration, reserving a like rent of 2s. 6d. in the pound amounting to 14l. 7s. 6d. per ann. 27 Sept. 1723. Minuted:—“Wt signed for 2 of these Houses in ye name of Thomas Lobbe.” Again:—“29 April 1725. Caveat entred by Mr Folkes on ye behalfe of the coheires of the late Lord Dover.” 5 pages. 28. An accompt of the debt due and owing on the pensions payable in the office of Walter Chetwynd, Esq., from Lady Day 1723 to Michaelmas 1724. Dated 30 Sept. 1724. 11 pages. 29. Address of the House of Commons of 1 Oct. 1723, recommending Lieut. Col. Samuel Freeman to the Lord Lieut. of Ireland for a suitable provision to be made for him. Also his petition to the House of Commons which states that he had served in all the wars of Ireland, Flanders, and Spain. Minuted:—“Warrt signd 5 Aug. 1724.” 2 pages. 30. 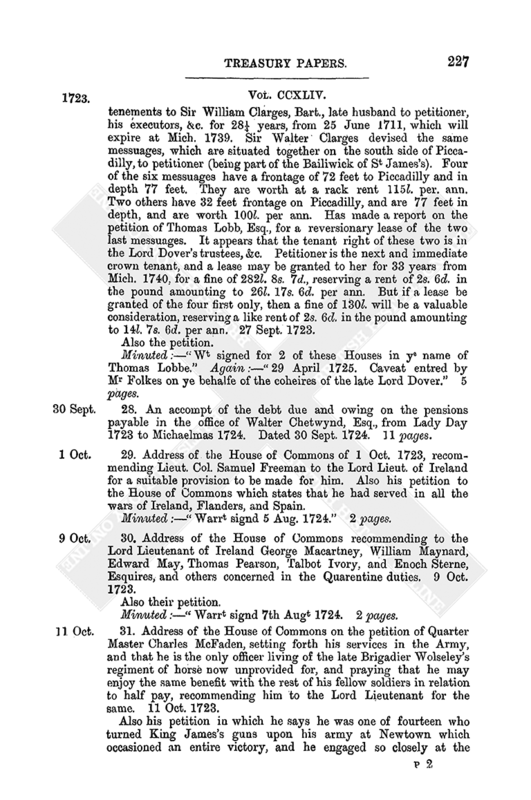 Address of the House of Commons recommending to the Lord Lieutenant of Ireland George Macartney, William Maynard, Edward May, Thomas Pearson, Talbot Ivory, and Enoch Sterne, Esquires, and others concerned in the Quarentine duties. 9 Oct. 1723. Minuted:—“Warrt signd 7th Augt 1724. 2 pages. 31. 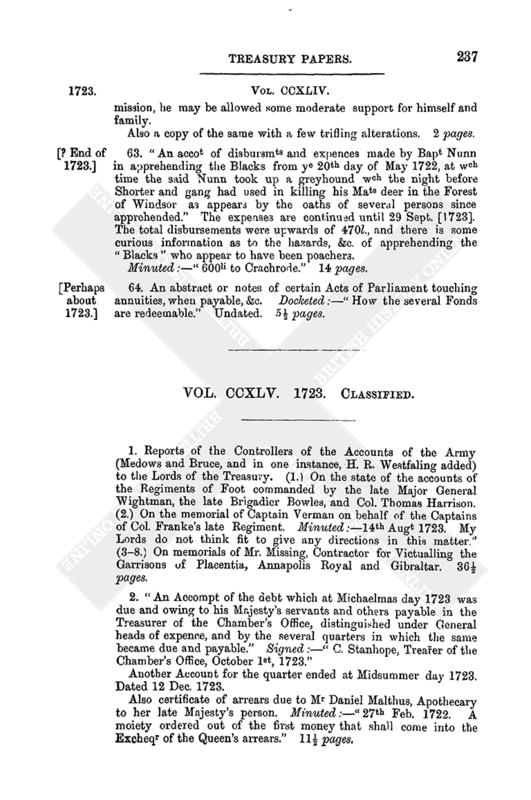 Address of the House of Commons on the petition of Quarter Master Charles McFaden, setting forth his services in the Army, and that he is the only officer living of the late Brigadier Wolseley's regiment of horse now unprovided for, and praying that he may enjoy the same benefit with the rest of his fellow soldiers in relation to half pay, recommending him to the Lord Lieutenant for the same. 11 Oct. 1723. Also his petition in which he says he was one of fourteen who turned King James's guns upon his army at Newtown which occasioned an entire victory, and he engaged so closely at the Boyne that his troop were all cut off to nine men, and he received so many wounds that day that he has been incapable of providing for himself ever since. Minuted:—“Warrt signd 7th Augt 1724.” 2 pages. 32. Address of the House of Commons, Ireland, to the Lord Lieut. on the petition of the Hon. Richard Stewart, Esq., for himself and others concerned in the Colliery of Ballycastle, Antrim. The address recommends that 2,000l. be paid to them to enable them the better to carry on the Colliery. 3½ pages. 33. P. Laurans to the Honble Mr Lownds, Secretary at the Treasury. Asks him to read the enclosed petition to the Lords of the Treasury. The petition referred to. It relates to a machine “infallibly proper for the discovery of the longitude upon sea” which the petitioner Peter Laurans had attained to the knowledge of making. He is destitute and asks that a sum of money which he understands has been collected and lodged with their Lordships may be handed over to him. Minuted:—“Read 16 Oct. 1723. My Lords cannot order any money upon this petition.” 3 pages. 34. J. Fauquier to Christopher Tilson, Esq. Desires that the Treasury order to be executed by him may be put upon the back of the proposal itself as was done in other cases. 15 Oct. 1723. Minuted:—“Proposall agreed to.” 3 pages. 35. Petition of Sir Polycarpus Wharton, Bart., to the Lords of the Treasury asking for payment of a balance due to him on his father's (Sir George Wharton's) account who was Treasurer and Paymaster of the Ordnance and died on 12 Aug. 1681. Petitioner has been a great sufferer by the Office of Ordnance occasioned by their breach of contract with him for eleven years ending 1698. To prevent his ruin, employed his thought upon “his shell” of which he annexes a description, and asks to be allowed a speedy trial of it. It contains much of the information found in the petition. 3 pages. 36. “Abbreviat by Sir Robert Sinclair, Barrt, receiver General in Scotland of receipts, payments, & remains of the rents and profits and sale of the forfeited estates in Scotland the twenty eight of Octor 1723, exclusive.” 1 large page. 37. “Resolution of ye House of Lords in favour of Luke Netterville, Esq.,” who was reduced to the utmost extremity, and had been received into the Church of Ireland by the Bishop of Dublin 16 years since. He had “educated his children in that faith,” and asked to be recommended to the Lord Lieutenant for civil employment. The Resolution recommends him to the Lord Lieutenant for civil employment, he being the first of his family who has been received into the Church of Ireland, and orders Lord Charlemont and the Lord Baron Ferrard to attend the Lord Lieutenant with the resolution. 31 Oct. 1723. 1 page. 38. Report (signed) of the Mayor and Jurats of Queenborough to the Lords of the Treasury. Had received a complaint in a letter from the Treasury of 15 Oct., made against them by persons employed by the Navy Board, viz., “that they were obstructed in the experiment of raising water on a piece of ground belonging to his Majesty near Queenborough,” and their “Lordship's intentions that they should be permitted to proceed in the manner they thought fit.” When these gentlemen came at the end of September they began directly to bore the well in the castle ground, and could not think it became them to take any notice of the Corporation, who had been in possession above three score years, and who claim a jurisdiction over it by charter; but they were in no ways interrupted; the Corporation resolved to represent the matter to their Lordships. The gentlemen succeeded in finding water, but obstructed the people (who were in great want) from having any. Give an account of the nature of the obstructions. The Mayor submitted to this ill treatment. After treating the Corporation in this manner, these gentlemen intermixed some aspersions in the account of their proceedings, in hopes of preventing their Lordships future favour to the Corporation, and were guilty of other incivilities and rudeness. Apprehend all this is occasioned from opposing the Commissioner in leasing the castle land for his own use; for Mr. James Young Master “Attendance” of Chatham Dock and Mr. John Ward, Master Shipwright of Sheerness Dock (two of the persons employed) publicly declared in the town that the Corporation might thank themselves and see what they had got by petitioning. The Corporation have the utmost zeal for his Majesty's service and are ready to submit to their Lps consideration their pretensions to this piece of ground. Pray that no proposal for conducting the water through the land belonging to the Corporation or for debaring them the free use of it (hitherto enjoyed) will be approved by their Lordships without admitting the Corporation to be heard. Queenborough, 6 Nov 1723. “12th 8br 1723. To the Mayor & Jurats of Queenbro desiring them not to proceed in stopping the offrs of the Navy & that my Lords will consider what is proper to advise his Maty relating to the grant of the Castle & other the lands there.” 8 pages. 39. 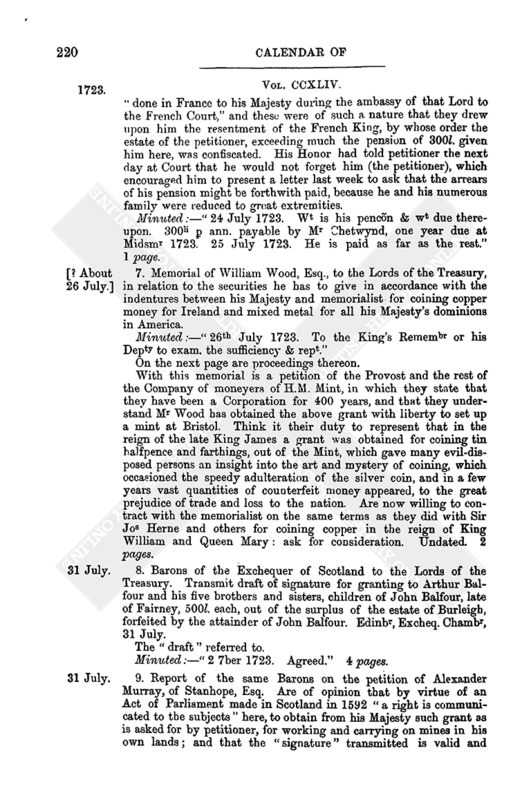 Report of Mr George Treby to the Lords of the Treasury on the memorial of Major James Cunningham, Deputy Governor of the Garrison of Fort William in North Britain who claimed 91l. 12s. 6d. for intelligence, extraordinary expenses and maintaining prisoners during “the Rebellion in the year 1719.” Finds that 150l. was annually allowed for contingencies &c. on the establishment of that garrison; that in 1719, 50l. was allowed to Sir Robert Pollock, the Governor, for intelligence &c., besides other sums for expresses &c., amounting to 460l. 19s. 9d. As for his demands in attending the General, conceives that it is every officers duty to bear such expenses out of his pay and that any additional allowance would be a dangerous precedent. Whitehall, 11 Nov. 1723. 1 page. 40. Mr William Cowper Clerk of the Parliament to William Lowndes, Esq. as to a payment of a fine by him into the Receipt of the Exchequer; and as to his discharge therefrom. Thinks he might have doubted how the Lords Comrs or any Court of Revenue could take regular notice of fines set upon record, or in the High Court of Parliament, without some previous estreat made of the record in form: asks him to ascertain how the matter stands. Essex Street in the Strand. 11 Nov. 1723. Also copy of a standing order of the House of Lords of 3 April 1624, in respect to mitigation of fines. 3 pages. 41. 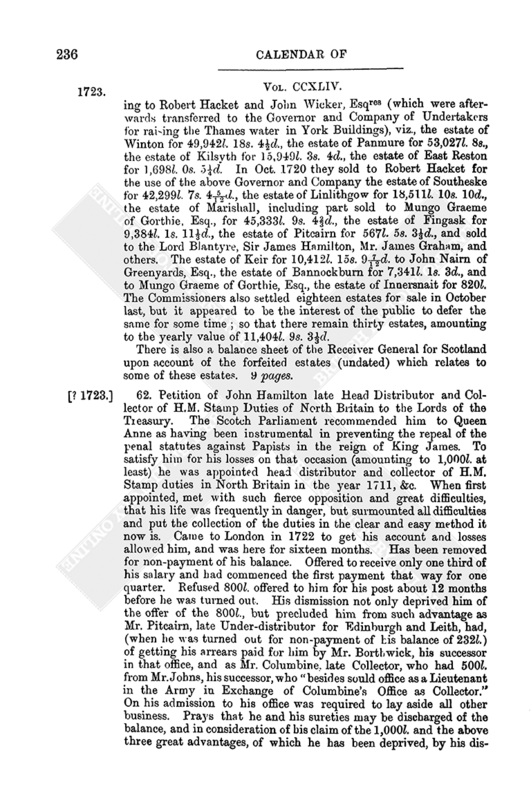 Report of the Barons of the Exchequer of Scotland to the Lords of the Treasury on the draft of a “signature” for continuing and “prorogating” to John, Earl of Bute his heirs and assigns, a lease of certain tithes within the Isle of Bute, granted by her late Majesty to the deceased James, Earl of Bute, for 19 years from Whitsuntide 1705, “and that for the further term of nineteen years”; as also for granting to the Earl for 19 years certain other tithes and few duties, in that Island, belonging to his Majesty “as come in place of the Bishop of the Isles”; paying for the same 11s. 1d. ⅓ sterling. Edinburgh, Exchequer Chamber, 21 Nov. 1723. The draft referred to. 5½ pages. On the dorse is the following report by Christopher Tilson. The princes's Body Laundress has 200l. p[er] ann. whereof Barbara Crow has 100l. and a German who dos the work has the other 100li. p[er] ann. The prince, princess, and their family were kept at the King's charge the 1st year of his reign, and notwithstanding Mrs Crow came over body laundress yet (as Mr. Lowman certifies) she had no allowance whatsoever for that year. The Countess of Buckenburg certifies to the same effect and that she has often (tho' in vain) sollicited her payment. The Prince before his revenue was setled received 70,000li. without account to be disposed as he should direct, besides which I find there was 5,000l. issued to Mr Molyneux for the Prince's use, but intended as the warrant expresses, to be repaid to the King out of such annual revenue as should be setled upon him. It dos not appear that this 5,000li. was ever repaid. Mrs Crow cannot assure me but that there may be others in like circumstances as to that year's arrear with herself, if so, the paying her alarms all the rest, and your Lordships will easily judge the consequences thereof. If Mr Lowman's certificate is obtained that she is the only instance, then she is in a proper way for your Lordships favour, otherwise it will be adviseable to obtain the repayment of the above 5,000l. before any demands of this kind be yielded unto. Minuted:—“6 Xber 1723 read.” 2 pages. 43. 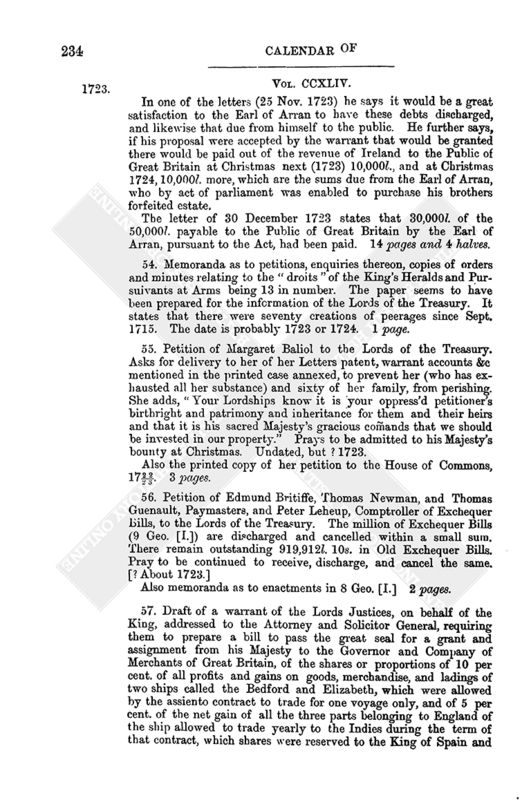 Petition of George Roe and Simon Sherlock in behalf of themselves and about sixty more creditors of James Leathly, Benjamin Taylor, and James Dugg[an] who where partners in clothing several regiments in Ireland, addressed to the Knights, Citizens, and Burgesses in Parliament assembled, praying them to recommend their case to his Majesty that they might have such reparation out of the estate of Sir William Robinson, Deputy Vice Treasurer General of Ireland (who, they complain, had illegally extorted several sums from them) as the justice of their case required. Also copy of a letter from the Lord Lieut. and Privy Council in Ireland sending and recommending a bill for the relief of the above creditors. Dated 24 Nov. 1723. 3 pages. 44. Report of the Lord Lieut. of Ireland to the Lords of the Treasury on the memorial of Captain John Southby, praying to be restored to half pay. The Lord Lieut. 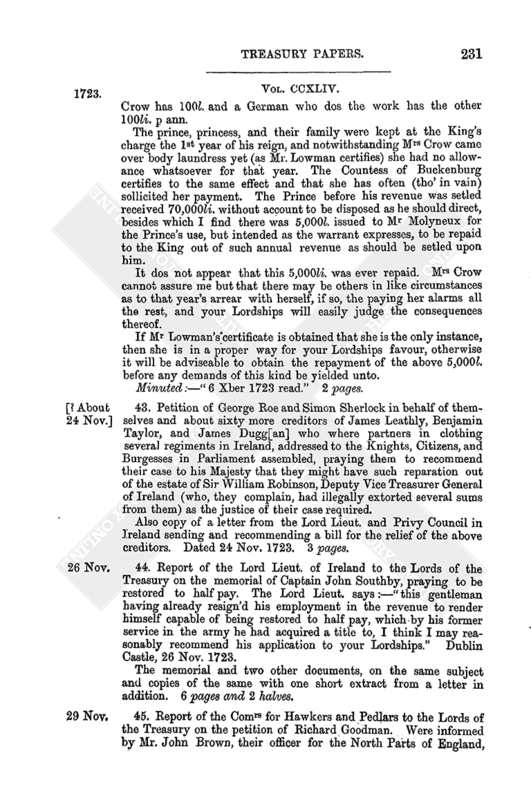 says:—“this gentleman having already resign'd his employment in the revenue to render himself capable of being restored to half pay, which by his former service in the army he had acquired a title to, I think I may reasonably recommend his application to your Lordships.” Dublin Castle, 26 Nov. 1723. The memorial and two other documents, on the same subject and copies of the same with one short extract from a letter in addition. 6 pages and 2 halves. 45. 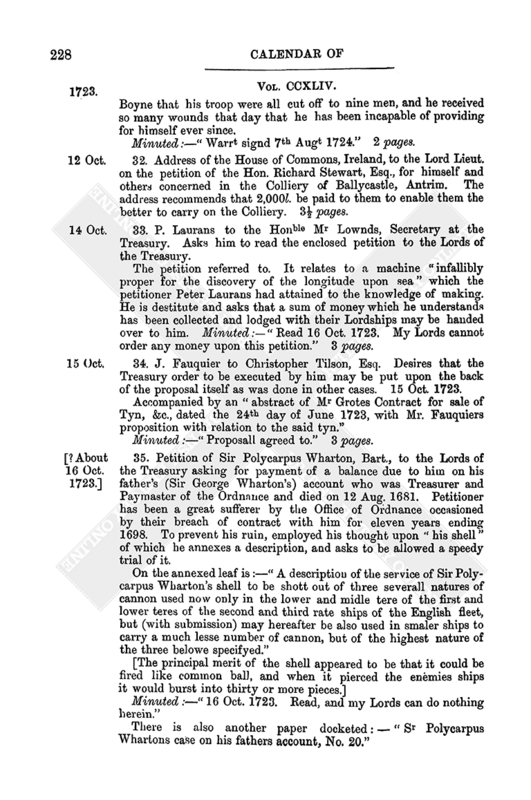 Report of the Comrs for Hawkers and Pedlars to the Lords of the Treasury on the petition of Richard Goodman. Were informed by Mr. John Brown, their officer for the North Parts of England, that the petitioner had been serviceable in discovering persons who traded without licences. He had “convened” a Scotch pedlar before a justice of the peace who would not convict him. The pedlar thereupon brought an action for false imprisonment against petitioner, who, however, obtained a verdict and had a certificate for treble costs. Petitioner, however, had not produced the record of the trial with a bill of his charges in defending the suit as he had undertaken to do. Hawkers Office, 29 Nov. 1723. The petition referred to. 2 pages. 46. Petition of James Leppan “to the Rt Honble Mr Robt Walpole Esq.” Was the only evidence for his Majesty at Carlisle against the rebels, and afterwards was commanded by the Duke of Roxborough to go into Scotland with Mr. Paxton “upon Ire and Termire”; where he was desperately wounded by some of the Government's enemies, and expected nothing but death till the Duke of Roxborough sent money and orders for him to come to London, where he lies in miserable condition confined in the Marshalsea Prison, Southwark, for debt, and where he must perish unless he has Mr. Walpole's assistance. Has petitioned the Treasury for a sum of money to discharge him from this place of torment and keep back his pension of 30l. a year until the sum is repaid. Minuted:—“Rejected 29th 9br 1723.” 1 page. 47. 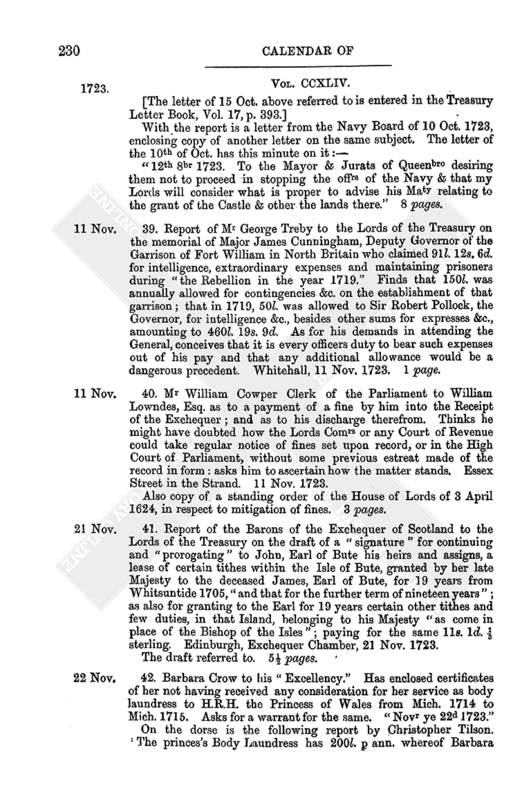 “State of the prosecutions carrying on [in the] Court of Exchequer in Scotland by English bills against the merchants in Glasgow; in obedience to ane order from the Right Honourable the … Commissioners of His Majesty's Treasury, dated the 27th of March 1723.” Custom Ho: Edinbr 5th December 1723. 3 pages (brief size). 3 pages. 48. Memorial of Mrs Ruperta Howe, Chief Rangeress of Alice Holt and Woolmer Forests in the county of Southampton, to the Lords of the Treasury. The repair of the several lodges of these forests would amount to 373l. and upwards, which she hopes their Lordships would order as well as the four years salaries of the keepers, at 130l. per ann. She also asks that the lodgings in Somerset House, in which she lives, may be repaired. 7 December 1723. Three other documents connected therewith. 5 pages. 49. Memorial of William Wood to the Lords of the Treasury. In the patent granted to memorialist for the American coin, there is mention of three several assays, viz., in the lump or ingot, in the fillet and in the coin, whereas two of them are needless; because the only end is to secure the goodness of the coin, and if that be according to the standard and will bear the assay, it is impossible that the ingot or fillet, from whence it was taken, should be bad: prays that the two fillets which he has seen may be accepted, the one to be kept in the Treasury and the other delivered to the Controller as standard for the coinage. Certificate at the foot that the Controller of the American coinage agrees to the memorial, provided he may have an order from the Treasury to pass the coin on proof of its malleability only: the patentee being always answerable for the compound. 1 page. 50. Memorial of the Managers (being 15 in number) appointed by the Lords of the Treasury to finish the work left unfinished by the first managers of the subscriptions to the South Sea Company on the Act 6 Geo. I. They describe the nature of the work they had performed, which consisted, amongst other things, in reducing seventy-seven volumes, of which the original subscriptions and lists consisted, into twenty-two volumes. To each of the twenty-two volumes there was a preface affixed, in which many errors and mistakes that appeared in the original subscription books, are certified into the Exchequer: praying consideration for their services. Minuted:—“4 Xber 1723. Agreed at the rate of 150li p[er] ann. and incidts to be paid all in discha of ye Commrs.” 1 page. 51. Memorial of Mrs Elizabeth Bridges to the Lords of the Treasury. There is due to petitioner from the late Queen Anne 102l. 10s. 3d. for rent of her house hired by the Comrs appointed to settle the Treaty of Commerce between Great Britain and France from 8 Feb. 1713 to 1 Aug. 1714: prays that the money may be ordered. A certificate in corroboration of the memorial dated 17 Dec. 1723. 2 pages. 52. 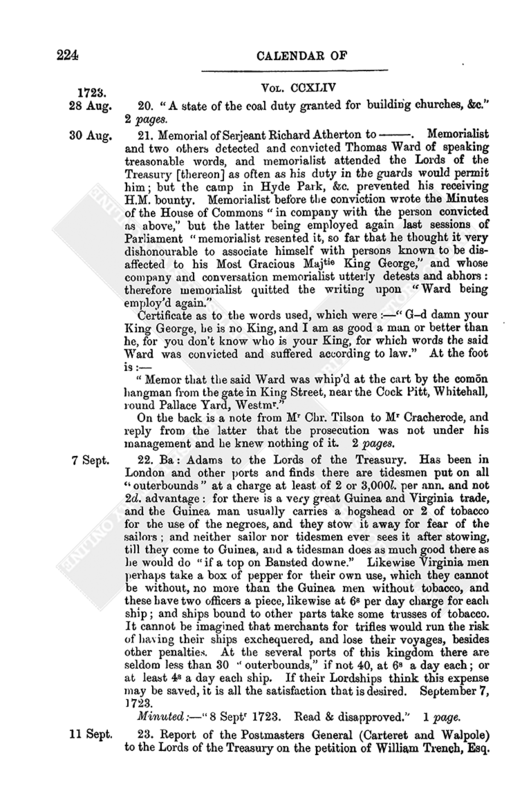 Report of the Commrs for licencing Hawkers and Pedlars to the Lords of the Treasury. In obedience to their Lps commands they were directed to open the door of the Office of Thomas Tomkins their cashier, in the presence of his sureties, and to inspect his books, chests and papers, and to give their Lps an account of the state of his cash, and likewise to seal up again the chests and office in the presence of the sureties. They opened the office and examined the papers and accounts which were in the utmost confusion. “There was not any bank or goldsmith note,” and only a few bills amounting to 20l. 13s. As for specie, there was none. Upon this the sureties declared themselves satisfied and declined any further inspection. The sureties of their free will delivered up the key to the Comrs. The annexed estimate will show the amount which Tomkins stood indebted to the Crown. Hawkers and Pedlars Office, 19 Dec. 1723. The estimate of the debt referred to amounting to 41,321l. 6s. 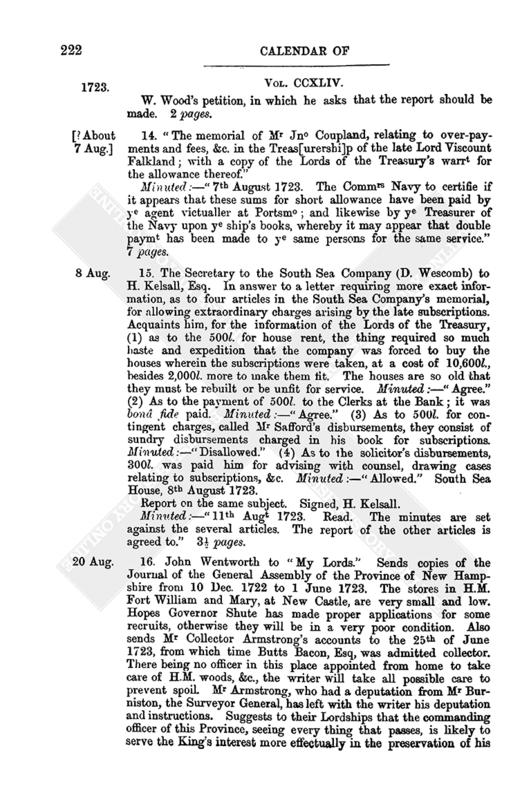 Also three other papers connected with these affairs, two of them being of a little later date, of which one relates to the appointment of a succeeding cashier. 8 pages. 53. Various letters and proposals of Mr Arch. Hutcheson addressed to [? the Secretary of the Treasury] in respect to the pension of 5,000l. per ann. granted to the late Duke of Ormonde by the late Queen, to enable him to discharge his debts, which pension was assigned to Mr Cotton, Mr Clayton, and Mr Hucheson in trust to pay his debts amounting to upwards of 45,000l. In one of the letters (25 Nov. 1723) he says it would be a great satisfaction to the Earl of Arran to have these debts discharged, and likewise that due from himself to the public. He further says, if his proposal were accepted by the warrant that would be granted there would be paid out of the revenue of Ireland to the Public of Great Britain at Christmas next (1723) 10,000l., and at Christmas 1724, 10,000l. more, which are the sums due from the Earl of Arran, who by act of parliament was enabled to purchase his brothers forfeited estate. The letter of 30 December 1723 states that 30,000l. of the 50,000l. payable to the Public of Great Britain by the Earl of Arran, pursuant to the Act, had been paid. 14 pages and 4 halves. 54. Memoranda as to petitions, enquiries thereon, copies of orders and minutes relating to the “droits” of the King's Heralds and Pursuivants at Arms being 13 in number. The paper seems to have been prepared for the information of the Lords of the Treasury. It states that there were seventy creations of peerages since Sept. 1715. The date is probably 1723 or 1724. 1 page. 55. Petition of Margaret Baliol to the Lords of the Treasury. Asks for delivery to her of her Letters patent, warrant accounts &c mentioned in the printed case annexed, to prevent her (who has exhausted all her substance) and sixty of her family, from perishing. She adds, “Your Lordships know it is your oppress'd petitioner's birthright and patrimony and inheritance for them and their heirs and that it is his sacred Majesty's gracious com[m]ands that we should be invested in our property.” Prays to be admitted to his Majesty's bounty at Christmas. Undated, but ? 1723. Also the printed copy of her petition to the House of Commons, 1722/23. 3 pages. Also memoranda as to enactments in 8 Geo. [I.] 2 pages. 57. Draft of a warrant of the Lords Justices, on behalf of the King, addressed to the Attorney and Solicitor General, requiring them to prepare a bill to pass the great seal for a grant and assignment from his Majesty to the Governor and Company of Merchants of Great Britain, of the shares or proportions of 10 per cent. of all profits and gains on goods, merchandise, and ladings of two ships called the Bedford and Elizabeth, which were allowed by the assiento contract to trade for one voyage only, and of 5 per cent. of the net gain of all the three parts belonging to England of the ship allowed to trade yearly to the Indies during the term of that contract, which shares were reserved to the King of Spain and by him left to be disposed of by the late Queen Anne, and since her decease have devolved on the present King. Dated — 1723. 6 pages. 58. Draft of a warrant by the Lords Justices to [the Attorney and Solicitor General] to prepare a bill containing an Indenture as therein set forth. Docketed:—“Indenture for settlemt of part of the Island of St. Christophers, wch was rendered by France, pursuant to the Treaty of Utrecht.” Dated — 1723. 11 pages (brief size). 59. “Copy of an Act passed in North Carolina in the year 1723 intituled An Act for Settling the Titles and bounds of lands.” [The copy perhaps was made some years later.] 11 pages. 60. Memorial of Lieut. Col. Laurence Armstrong to the Lords of the Treasury. Their Lps directed by warrant of 31 Jan. 1722 the secretary-at-war to prepare a warrant to pay memorialist 800l. for his services and losses in North America. The secretary alleges there is no fund for payment thereof. Will be obliged to dispose of his commission to prevent being cast into prison, which, after 29 years faithful service, memorialist hopes their Lps will not permit. Prays directions may be given for payment. [This matter is referred to in the Register of Papers, p. 185, under 8 April 1724, and again at p. 195, under 19 May 1724. The entry in the last is “Col. L. Armstrong rel. to 800li ordered him for services at Canso. Recall the letter to ye late Sec[reta]ry at War and direct it to Mr. Pelham the present Sec[creta]ry.”] 1 page. 61. 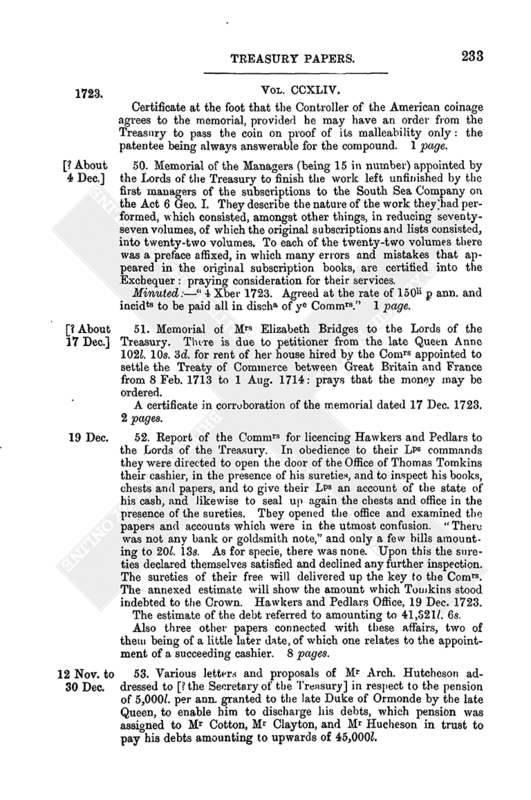 A draft or copy of a report of the Commissioners for forfeitures, Scotland, entitled:—“A further report humbly offer'd by the Commissioners and Trustees for the forfeited estates who acted in Scotland, &c.” They remark amongst other matters that in the year 1719 they determined 350 claims, and in 1721 and 1722, 205 claims, and there remain 998 claims; and a great number of these have been under their consideration. Appeals have been entered in 53 cases, &c. 22,737l. have been ordered to be paid into the Exchequer of Scotland. Give reasons why the sum is not greater and though they have used all the powers vested in them which they could give to stewards or factors for recovering the rents, &c. of the forfeited estates in the northern parts of the Highlands and Isles of Scotland, they have proved too weak for the opposition made by the tenants of those estates. Mention as a proof that in October 1721, William Ross and Robert Ross, their factors, on the estate of Seaforth, Glenmoriston, Strathglass, &c. going upon the estates, to perfect the rentals and collect the rents, were opposed by armed force. In this service William Ross was wounded and his son killed, and others were wounded. The charge of the Commission had been between 24 June 1716 and 24 June 1722, 58,641l 5s. 6¾d. ; the income and expectations 61,231l. 13s. 8¼d. The Comrs and Trustees in Oct. 1719 sold the several estates following to Robert Hacket and John Wicker, Esqres (which were afterwards transferred to the Governor and Company of Undertakers for raising the Thames water in York Buildings), viz., the estate of Winton for 49,942l. 18s. 4½d., the estate of Panmure for 53,027l. 8s., the estate of Kilsyth for 15,949l. 3s. 4d., the estate of East Reston for 1,698l. 0s. 5¼d. In Oct. 1720 they sold to Robert Hacket for the use of the above Governor and Company the estate of Southeske for 42,299l. 7s. 45/12d., the estate of Linlithgow for 18,511l. 10s. 10d., the estate of Marishall, including part sold to Mungo Graeme of Gorthie, Esq., for 45,333l. 9s. 42/3d., the estate of Fingask for 9,384l. 1s. 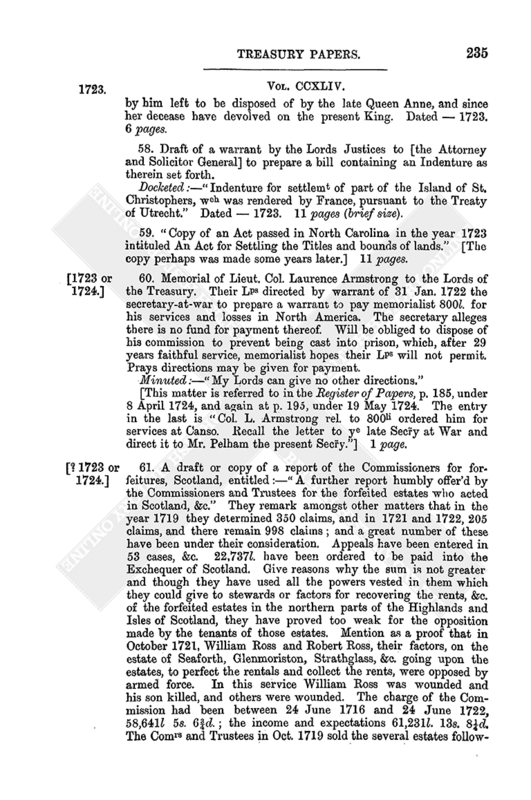 11⅓d., the estate of Pitcairn for 567l. 5s. 3⅓d., and sold to the Lord Blantyre, Sir James Hamilton, Mr. James Graham, and others. The estate of Keir for 10,412l. 15s. 97/12d. to John Nairn of Greenyards, Esq., the estate of Bannockburn for 7,341l. 1s. 3d., and to Mungo Graeme of Gorthie, Esq., the estate of Innersnait for 820l. The Commissioners also settled eighteen estates for sale in October last, but it appeared to be the interest of the public to defer the same for some time; so that there remain thirty estates, amounting to the yearly value of 11,404l. 9s. 3⅓d. 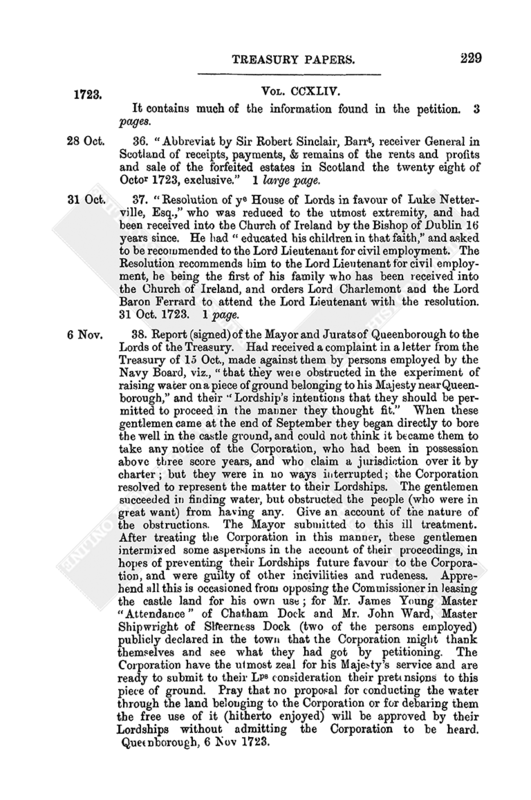 There is also a balance sheet of the Receiver General for Scotland upon account of the forfeited estates (undated) which relates to some of these estates. 9 pages. 62. Petition of John Hamilton late Head Distributor and Collector of H.M. Stamp Duties of North Britain to the Lords of the Treasury. The Scotch Parliament recommended him to Queen Anne as having been instrumental in preventing the repeal of the penal statutes against Papists in the reign of King James. To satisfy him for his losses on that occasion (amounting to 1,000l. at least) he was appointed head distributor and collector of H.M. Stamp duties in North Britain in the year 1711, &c. When first appointed, met with such fierce opposition and great difficulties, that his life was frequently in danger, but surmounted all difficulties and put the collection of the duties in the clear and easy method it now is. Came to London in 1722 to get his account and losses allowed him, and was here for sixteen months. Has been removed for non-payment of his balance. Offered to receive only one third of his salary and had commenced the first payment that way for one quarter. Refused 800l. offered to him for his post about 12 months before he was turned out. His dismission not only deprived him of the offer of the 800l., but precluded him from such advantage as Mr. Pitcairn, late Under-distributor for Edinburgh and Leith, had, (when he was turned out for non-payment of his balance of 232l.) of getting his arrears paid for him by Mr. Borthwick, his successor in that office, and as Mr. Columbine, late Collector, who had 500l. from Mr. Johns, his successor, who “besides sould office as a Lieutenant in the Army in Exchange of Columbine's Office as Collector.” On his admission to his office was required to lay aside all other business. Prays that he and his sureties may be discharged of the balance, and in consideration of his claim of the 1,000l. and the above three great advantages, of which he has been deprived, by his dismission, he may be allowed some moderate support for himself and family. Also a copy of the same with a few trifling alterations. 2 pages. 63. “An accot of disbursmts and expences made by Bapt Nunn in apprehending the Blacks from ye 20th day of May 1722, at wch time the said Nunn took up a greyhound wch the night before Shorter and gang had used in killing his Mats deer in the Forest of Windsor as appears by the oaths of several persons since apprehended.” The expenses are continued until 29 Sept. . The total disbursements were upwards of 470l., and there is some curious information as to the hazards, &c. of apprehending the “Blacks” who appear to have been poachers. Minuted:—“600li to Crachrode.” 14 pages. 64. An abstract or notes of certain Acts of Parliament touching annuities, when payable, &c. Docketed:—“How the several Fonds are redeemable.” Undated. 5½ pages.